Posted in Immigration, Social JusticeLeave a Comment on Show up to support the Austin Sanctuary Network at City Council! It has been a little under a month since we announced our support for Alirio Gámez. Alirio remains in sanctuary at the First Unitarian Universalist Church of Austin, and it remains the case that should he leave sanctuary and be apprehended by ICE, he will be apprehended by ICE and will be deported back to El Salvador. Should that happen, his life is at risk. The time has come for us to change tactics in our support for Alirio. Last month hundred of us signed a petition demanding ICE officials use prosecutorial discretion to leave Alirio alone and let him stay. Now let them hear our voices. We’re asking you to make a short telephone call to stop Alirio from being deported. We’ve made calls to our elected representatives now hundreds of times to push back on Trump and his agenda; now lets use our time and our passion on behalf of Alirio. Please make a call today (Thursday 11/9) or tomorrow (Friday 11/10) during business hours to Immigration Customs Enforcement Deputy Chief of Staff Norma Lacy at 210-283-4750. When you get a long voice mail, press 3 and leave a message. If someone answers and asks you questions, reply, “Talk to his attorney.” Help us keep track of how many calls have been made on his behalf by emailing ewelliver@grassrootsleadership.org to give us a report. Thank YOU. Indivisible Austin is admiring and amplifying the work of the Austin Sanctuary Network and Grassroots Leadership in their support for Alirio and many other causes. For more information check out those organizations. In fact, Alirio’s life is at risk if he is deported back to his native El Salvador. In 2015 Alirio left his job and his family to escape the violence crippling his country, and threats directed towards him. After traveling by land to enter the United States, Alirio was picked up by ICE and pressured to leave, but instead he pursued the legal course of action to seek political asylum. In May, his asylum was denied and he was issued a deportation order. 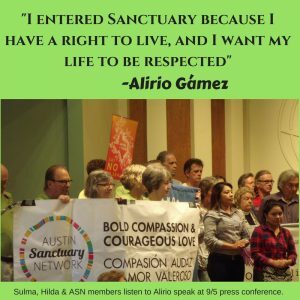 Alirio’s situation came to the attention of the Austin Sanctuary Network, a coalition of over 25 congregations and nonprofits in Austin, who helped Alirio find sanctuary at First UU. 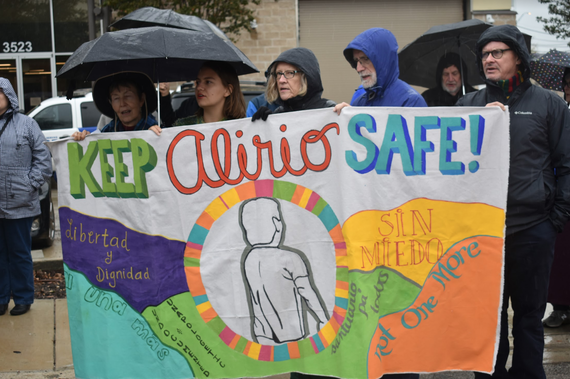 Together the Austin Sanctuary Network and Alirio are preparing to fight until Alirio is granted prosecutorial discretion by ICE to stop his deportation. The ASN has launched a petition campaign with that goal, and we’re asking you to sign on. By signing the petition online, you not only add your name to the hundreds who have already, but you will automatically send an e-mail directly to ICE officials Norma Lacy and Daniel Bible requesting they use their prosecutorial discretion to allow him to remain in our community. While Alirio is just one man, every victory against America’s deportation regime chips away at the system. In 2015, the First Unitarian Universalist Church provided sanctuary to Sulma Franco, an LGBTQ activist from Guatemala who faced persecution and violence in her home country because of her sexual orientation. Sulma was the first person to seek sanctuary from deportation in a church in Texas since the Sanctuary Movement of the 1980s, but her situation ended in victory: with broad support from the community, Sulma won a Stay of deportation and 15 months later earned her US resident card to stay. We can win for Alirio too. The extreme violence Alirio faced in Central America has everything to do with America’s militarized and politically hyperbolic “war on drugs”, combined with its insatiable appetite for those same drugs. In spite of this, the US denies asylum to 83% of seekers from El Salvador, 77% from Guatemala, 80% from Honduras and nearly 90% from Mexico. Many asylum seekers, especially those coming from Central America, do not have legal representation as they formally seek asylum in the US — 30% from El Salvador do not. By winning individual victories we can chip away at the legal culture of default deportation, and establish increasing precedence for asylum seekers to stay. Also, we might help save Alirio’s life. That’s why we’re asking you to sign the petition to stop Alirio’s deportation. To keep up with this situation and learn more follow the Austin Sanctuary Network on Facebook. De hecho, la vida de Alirio está en riesgo si lo deportan a su país natal, El Salvador. En el año 2015, Alirio dejó su trabajo y a su familia para escaparse de la violencia que está devastando su país, y de amenazas dirigidas hacia él. Después de viajar por tierra para entrar a los Estados Unidos, Alirio fue recogido por ICE y fue presionado a irse, pero optó por ejercer su derecho a buscar asilo político. En mayo, su asilo fue negado y recibió una orden de deportación. La situación de Alirio llegó a la atención de la Red Santuaria de Austin (ASN), una coalición de más de 25 congregaciones y organizaciones sin fines de lucro en Austin, quien le ayudó a Alirio a encontrar santuario en la Primera Iglesia Unitaria Universal de Austin. Juntos la Red Santuaria de Austin y Alirio se están preparando a pelear hasta que ICE anule su orden de deportación. La organización ASN ha lanzado una campaña de petición con esa meta, y estamos pidiendo que usted también se apunte. Al firmar la petición en línea, usted no solo añade su nombre a los centenares que ya lo han hecho, sino también puede mandar automáticamente un correo electrónico a los oficiales de ICE, Norma Lacy y Daniel Bible, solicitando que ellos usen su discreción para permitir que Alirio permanezca en nuestra comunidad. Aunque Alirio es un solo hombre, cada victoria contra el régimen de la deportación americana debilita y desafía el sistema. En 2015, la Primera Iglesia Unitaria Universal de Austin proveyó santuario a Sulma Franco, una activista LGBTQ de Guatemala quien se enfrentó a la persecución y violencia en su país natal por su orientación sexual. Sulma fue la primera persona en buscar santuario de deportación en una iglesia de Tejas desde el Movimiento Santuario en los años 1980, pero su situación terminó en victoria: con un apoyo extenso de la comunidad, Sulma ganó una suspensión de su orden de deportación y, 15 meses después, obtuvo su tarjeta de residencia de los Estados Unidos para quedarse. También podemos ganar por Alirio. Toda la extrema violencia que Alirio enfrentó en Centroamérica tiene que ver con la militarización de América y la hiperbólica política de “la guerra contra las drogas”, combinado con el insaciable apetito por esas mismas drogas. A pesar de esto, los Estados Unidos niega asilo a 83% de los buscadores del Salvador, 77% de Guatemala, 80% de Honduras y casi 90% de México. Muchos de los que buscan asilo político, especialmente los que vienen de Centroamérica, no tienen representación legal cuando buscan asilo en los Estados Unidos– el 30% de solicitantes del Salvador no la tienen. Al ganar victorias individuales, podemos debilitar y socavar este sistema que siempre opta por deportaciones y establecer un precedente para que los buscadores de asilo se puedan quedar. Nosotros también podemos ayudar a salvar la vida de Alirio. Por eso les pedimos que firmen la petición para parar la deportación de Alirio. Para estar al día con esta situación y aprender más, sigan la Red Santuaria de Austin en Facebook.